"Words fall short to describe how amazing both Jen and Brian are as human beings and professionals. And how much it has meant for us to share and capture the most beautiful day of our lives with them. From the very first moment I got in touch with Jen through social media, I felt such humanness, genuine care, and kindness that there was no doubt her and Brian were the ones we wanted to capture our wedding. Even before the wedding was close, Jen’s unconditional presence throughout the whole planning and preparation process was unbelievable. So attentive to every detail and how she could contribute, guide, inspire and support us throughout the whole process. Her great experience with weddings and working in the industry was of enormous contribution, beyond the pictures and video alone. Jen’s great sensitivity and perfect understanding of what we wanted for our wedding day, were key in putting the whole vision and bigger picture together. The day of the wedding when we finally got to meet Brian and Jen in person, we couldn’t have felt more grateful to have had these two amazing human beings with us. There is something so special about them, that immediately we felt so comfortable, so at ease, so well taken care of. Taking pictures with them felt so natural, so comfortable, so fun that it just flowed and flowed. And taking the pictures & video became so much more than just posing, but rather a true heart felt magical experience. The pictures from the wedding turned out absolutely stunning. So beautiful. So genuine. So natural. They completely capture the essence of our relationship and our wedding day. We couldn’t be more happy and grateful about them. Jen and Brian’s divine personalities permeate through everything they do. Not only an extremely talented photography + videography duo, they have become our dearest friends. Its impossible not to love them! If you are planning to get married, I really wish you can have such an amazing experience as we did with Jen & Brian. You rock!" Where do I start in sharing my incredible experience with Jen and Brian? The obvious: Jen takes the most gorgeous photos ever. Ever. I knew I wanted her to be my photographer before we had ever communicated. Her photos are so moody and dreamy and unreal beautiful. The fact that after we first talked, I realized she and Brian were the kindest, most genuine and caring team ever was icing on the cake. From our incredible engagement shoot and tear-inducing video to our jaw-droppingly beautiful wedding photos, I am so, so glad I got to work with them on our special day and so grateful for their talents. Beyond their amazing artistry, Jen was so helpful with creating timelines for the day and vendor suggestions. She knows her stuff. Brian and her made us both feel so comfortable on our wedding day. Giving lots of words of encouragement and getting really creative with shots. I also really appreciated how efficient they were on the day - knowing exactly where to go, what shots we needed, and helping things run smoothly and quickly so we didn't miss too much of the wedding fun. Given their ability to do that and the fact they took the most insanely beautiful photos as well should be reason enough to book them now. Seriously. Literally every, single, one of my friends has commented that my wedding photos are the most amazing photos they have ever seen. Brian is so gifted as well. Creating the most emotional, stunning, human and authentic videos of the most important day of your life. The video/photo combo is a must and as soon as you see your engagement video, you will want a wedding one too. I can't wait to relive the best day of my life through their incredible work. "My elopement photography experience with Jen was incredible. She was so easy to communicate with over email, and she showed up on time and instantly started working, snapping away photographs. She doesn't waste any time capturing the moments. She thinks of all the small details, and is so bright and easy going. I'm not usually comfortable in front of a camera, but she made the experience feel natural, so I could focus on having fun with my husband. Her style is beautiful, candid and warm. We have so many beautiful photographs to cherish from our elopement on the Sunshine Coast. I cannot recommend high enough!" "I came across Jen on instagram and immediately fell in love with her work. We booked her right away and were so pleased she was available! It’s actually hard to even explain in words how supportive Jen was through our entire planning process – she truly goes above and beyond the role of a photographer; helping find vendors, passing on links from previous brides, ensuring the timeline for the day will flow and encompass everything that is important to us (and went back and forth with me on the phone, and by email until it was perfect!). She always answered emails efficiently and thoroughly, was always kind and professional, and knows the sunshine coast and the venue we chose (West Coast Wilderness Lodge) like the back of her hand – it made a world of difference. On the day of the wedding, Jen and her team (Brian and Pauline) arrived early and as soon as they got there they were straight to work. Jen, Pauline and Brian all have this way of being present, but are never in the way of your next step. They are right where you expect them to be when you look, but are discrete as they move around to capture every special moment. We got to know Jen and Brian fairly well over the year and through our engagement and wedding photos, and they are 2 of the nicest people we have ever met. They are easy going, a joy to get to know, friendly, and fun to be around. They encouraged us to be ourselves, to pretend as if they weren’t there watching….and we did just that. Jen’s style was not to set us up in poses, but rather to let us be us, and capture who we truly are together – which we absolutely loved and is what the photos reflect. When we woke up on the day after our wedding Jen had a handful of photos already in our inbox waiting for us…what a joy to wake up to! Jennifer Picard and her team captured the most special day of our lives in a way that we will be forever thankful for. The photos are exactly what we hoped for, dreamy, beautiful, fun, and a true example of the love and happiness we share for each other. If we did it all over again – she would be our first choice, no questions asked. Thank you to Jen, Brian and Pauline for your hard work, your endless support throughout the process, your patience, and your ability to capture exactly what we hoped for - we could not be happier with the photos and video. The wedding film is so incredible. The attention to detail throughout is incredibly apparent and I cannot imagine the countless hours and thought that went into making this what it is. There are so many precious moments that they clearly ensured to include….My Dad and I nodding to each other as we signal we are ready to walk down the aisle, the clip in the forest where my eyes are closed and I open and look up at Matt and we connect and both smile….kissing my nephews hand….Matt and his best man having a laugh….my maid of honour and I dancing….I love how you included the sign my Dad made at the beginning……Matt and I walking the dock hand in hand…..the sound of the plane engine, the sound of the birds chirping in the forest, the vows playing over the top…wow. Every single second has been thought through and fit together perfectly. The music is perfect. Instrumental classic…..faded into a brilliant celebratory tune. The whole thing literally makes my heart sing. Thank you, thank you, thank you. This is truly a treasure that we have for life. Thank you for offering this to us - it is the best gift." "As a destination wedding bride, I randomly found Jen through Instagram. My husband and I were immediately drawn to how she easily captured the intimacy and love between her couples through her photos. Her photography tells a story and exhibits so much emotion, we knew that's how we wanted our wedding day to be captured. The first time we worked with Jen was for our engagement photos. We communicated with Jen so many times prior to our engagement photos, specifically asking for recommendations on where to take them. We sent her descriptions of what kinds of views we wanted in our engagement photos and she was quick to respond with multiple suggestions. Jen really listens to her couples and takes the time thoroughly answer questions. My husband and I were worried about how awkward it would be to be photographed, but Jen made the experience so wonderful. Jen has such a calming presence and she really allowed us to act naturally with each other while she photographed. The day of our wedding was beyond anything we could have imagined and we are so grateful we had Jen and her partner, Brian, with us on our wedding day. Jen has been sending us sneak peak photos and we cannot believe the individuals in her photos are us! Her photography skills are amazing! The views from our venue, the angles, and the emotions she captured in our photos make us want to relive our wedding day over and over again! Speaking of reliving our wedding day, Brian sent us a surprise video of our wedding just days after! Thank you so so much, Brian! My husband and I appreciate and admire Jen's work because of her ability to allow her viewers to feel emotion in the stories she tells through her photos. Jen is so incredibly talented and such a kind person. We are so thankful we randomly found her on Instagram and hired her to be our photographer. She really captured the joy and love my husband and I felt on our wedding day, surrounded by our closest friends and family who traveled to be with us"
"Jennifer, Brian and Pauline captured some absolutely AMAZING moments with stunning photos from our wedding day! They are extremely professional, very responsive to emails/questions, and I am absolutely thrilled they were able to be a part of our wedding day! Jen's focus on capturing candid moments truly makes for the best photos as it depicts the true emotion of the day! Everyone is so talented, and Ryan and I are just so excited with what Jen was able to capture. I do have to say that Jen goes above and beyond as a photographer, helping us create a perfect schedule for the wedding day and photo timeline, and keeping me calm despite the slightly rainy weather. Jennifer Picard definitely deserves the top recommendation possible! We hope that we will get to work with Jen again in the future to capture other life milestones. Also, the wedding film is AMAZING and PERFECT!! Ryan and I watched it, laughed, and cried. We think it captured the day so perfectly. We cannot thank you, Brian, and Pauline enough; you guys truly captured such a special day, and I could not be more greatful!!" "What a joy to have such an intuitive, talented and caring photographer and videographer at our wedding. They both captured the moment with exquisite grace. They both brought out that light inside that shines so bright when you are so entirely elated. They picked the best backdrops, the best light and captured the natural moments so skillfully. Thank you!" "There truly are not enough words to describe how lovely, talented, thoughtful, moving, and in tune Jen is as a person and also with her work. I came across Jen while looking for a photographer for our backyard wedding. I immediately fell head over heels in love with her photographs. Me and my husband are both extremely camera shy and we're super nervous about our engagement shoot. Jen and her partner Brain changed all that for us. From the moment we met them they calmed us down and made us feel comfortable in front of the camera. They know exactly how to photograph you in the most natural way, me and sam forgot we were even being photographed since Jen and Brian made the process so fun and easy. Fast forward to our wedding day. I had a lot of fabulous vendors but I can easily say that Jen and Brian were our favourite. They were extremely professional, easy going, attentive and were exactly what we needed for a very busy wedding day. Jen even went so far as to fix my hair for me when wind and a troublesome veil caused it to fall apart... she has many hidden talents! I cannot stress enough how wonderful Jen and Brian are, and how incredibly talented they both are. Jen and Brian's photographs tell wonderful love story's and make you feel as if you are apart of a fairytale. I will be forever recommending them to all my family, friends, and strangers who are in search of wedding photographers. They made mine and Sams wedding day so special and I can never thank them enough." "When my husband and I thought about what we were looking for in a wedding photographer we wanted someone with an eye to capture “the moment,” someone we felt comfortable around, and the obvious – someone who is talented. We knew Jennifer was the right choice for us from the moment we talked with her about our wedding. What drew us to her initially was her amazing portfolio, but what solidified our choice was our connection to her. Jennifer made us feel so comfortable during our engagement session and the photos turned out fantastic. She has a great ability to direct for an awesome shot, yet at the same time allowing us to be ourselves. As our wedding date approached, Jen was there to help with shot suggestions, and help with a wedding timeline… she really went above and beyond! By the wedding day, it felt like my friend, who happened to be our photographer, was there. I knew I could count on her, and it was so nice not worrying about the photos – we knew we were in good hands with Jennifer and Brian. I would say the best thing about Jennifer is her ability to guide the couple, wedding group and scenario at that moment, but without being obtrusive, capturing the emotion and moment at that time. We have had so many compliments from friends and family about her and Brian during the wedding, and how amazing our photos turned out. You will not be disappointed hiring her – she truly is amazing at what she does!" "Anyone can take photos, but Jennifer captured the real us as we really are. Nothing felt out of place, contrived or awkward. This is important because it’s what allows the photos to be exceptional in their balance, beauty and presentation of authentic emotion. Jennifer has a remarkable ability to see and capture moments. Better yet, she does it in an enjoyable, relaxed and comfortable manner where we couldn’t help but have fun and be ourselves. Her energy brings out the best in you and her truly creative eye captures it. Working with Jennifer was a treat. She’s professional, courteous, prompt and loves what she does." "We absolutely LOVED working with Jennifer and Brian over the last few months. Jennifer has been SO helpful during the entire planning process, offering suggestions and responses to things that do not even have anything to do with being our photographer. She has helped us with things such as planning a wedding day timeline, to finding somewhere to buy long-lasting sparklers for our first dance. Seriously, she goes above and beyond the job! Both her and Brian are just such delightful people to work with and made us feel comfortable as soon as we met them at our engagement shoot (and believe me, we were nervous)! She is truly an expert at what she does, and got so many AMAZING shots at our engagement shoot. Brian also filmed an engagement video for us, which was just gorgeous! He did such a good job getting the perfect shots and edited them together beautifully. Honestly, my fiancé Chris made fun of me for watching the engagement video over and over and over again – but I just loved it SO much! We cannot say enough good things about these two! They were wonderful to have around on the wedding day and from the moment they arrived knew exactly what they were doing and got things moving – starting with the little details, such as dress, shoes, rings, etc. Not a second was wasted! Jen and Brian checked in with us throughout the wedding day, but also were able to step back and let things flow naturally, which was the perfect balance. They were such a calming presence to have around, but fun and professional all at the same time. We cannot wait to see more of our wedding photos, and I’m sure I will be back on here raving about them again! Seriously, you are not going to find a better duo for wedding photography!!!" "When Chris and I were looking for a photographer, the obvious and most important thing was that they would be able to capture our memories in a raw, real, and beautiful way. The second most important thing was that they would have a connection with us, and the people we love and have an understanding of all that we hold dear. From the beginning, Jennifer was perfectly balanced in her approach with us being professional and attentive yet having a calming, relaxed presence that soothed our nerves when we first took our engagement photos. She really let Chris and I do "US" - only slightly guiding us in our positions to capture the scenery just right or flatter our best features. We knew we had struck GOLD with Jennifer just by the memories made, the fun times, and the overall fantastic experience of the day! When the sneak peaks came out in a few days we felt like me had WON the photography lottery with the stunning pictures she presented us. It was such a relief not having to worry - as far as photography goes - on our wedding day. We had no doubt Jennifer would take care of us and our memories. If it could not get any better, Brian, Jen's photography partner, was a delightful addition to her package and made Chris feel at ease when taking pictures of the groomsmen. The two of them together were a peaceful yet powerful force to be reckoned with, with photos covering the entirety of the day including those special moments that you didn't think were caught on camera - that small tear of joy from a loved one or that goofy face when sneaking a sip of fireball - every moment was perfectly captured. I could go on and on about Jennifer Picard Photography but I will close by saying the photos say it all. Chris and I have the most treasured group of photos of a day we will never forget. Photos of the moments we shared and photos of the things we were too wrapped up to see but are so glad we have. Thank you Jen and Brian for your mindful, and peaceful presences and for your IMMENSE talents in capturing our very special day." “My Husband, Mitchell and I hired Jen to photograph our wedding and we honestly can’t say enough great things about her or Pauline her Second Photographer. I was especially happy with how at ease Mitchell was with her, knowing that would translate through the photos the day of. We had engagement photos included in our package and I would highly recommend other couples to do the same. We never had professional photos before and this gave us both the opportunity to get comfortable in front of the camera with Jen before our wedding day. We wanted our engagement photos to be taken in a special and remote location that required a hike and Jen was totally up for the adventure, no questions asked. The photos she captured for us were stunning and we treasure them almost as much as our wedding photos. The days leading up to the wedding, Jen answered my various emails about location, timing, etc quickly and patiently. She had great suggestions for locations that would work best for our group and vision. The day of the wedding Jen and Pauline arrived with positive, fun and relaxing energy which we really appreciated. They were able to immerse themselves so naturally into our day and because of that they captured many genuine and candid moments that tell our story better then any posed shot could. As we received our photos from Jen we were blown away. We’d had high expectations of Jen from the beginning and she exceeded them all. While going through the photos, we laughed, we cried, we were in awe of everything she did. We were able to feel and relive so many emotions while looking at our photos and we know where going to feel that way every time we look at them for years to come. "Our engagement and wedding photos were done by Jennifer and we could not have picked a better photographer. Jennifer's work was beautifully captivating and has such a fine art quality. She's a brilliant editor and created a photo album which told our story. Jennifer's professional assistance was not limited to photography, her knowledge of the different aspects of planning a wedding was priceless and she helped us put together an extraordinary wedding team. Thank you Jennifer for helping us with creating and preserving such beautiful memories of our wedding day." "Having amazing memories for years to come was a huge priority when planning our wedding. Jennifer has such a creative eye and understood our vision right away. She is incredibly warm, easy going and made everyone feel comfortable in front of the camera. Our photos captured every smile, laugh, and tear of the day and we can't wait to enjoy them for a lifetime." "Our wedding photos are absolutely beautiful! We love them!! So amazing, breathtaking and just wow! We can't thank you enough for your everything. It was so much fun shooting with you! Everyone we've been showing the photos to are just simply blown away. I can't stop looking at them myself. Damn you made us look good! We will cherish these images forever and for that we thank you from the bottom of our hearts. Thank you so much for making our special day so incredibly memorable and capturing the beauty of it all." "Jennifer is a brilliant photographer with an amazing ability to capture subtle emotion and fleeting moments. We were so impressed with the photos she took of us and the professionalism with which she handled every single detail. Working with Jen is a truly low pressure, low stress experience that allows your true self to shine through -- and while you're being busy being you, she's busy capturing it all with her unique style and creative voice. We highly recommended Jennifer!" "We loved our photo session with Jen on our wedding day. From the beginning she was very friendly and easy to work with. We had to arrange everything from overseas and she was quick to respond to any of our questions or concerns via email or phone. Which was very comforting! She was very professional and organized on the day and the wedding photography felt effortless and fun. We couldn't be happier with the final product, the photos turned out absolutely stunning. We constantly get compliments from family and friends on the quality of the photos. We highly recommend her to anyone looking for a photographer to capture their special moments." 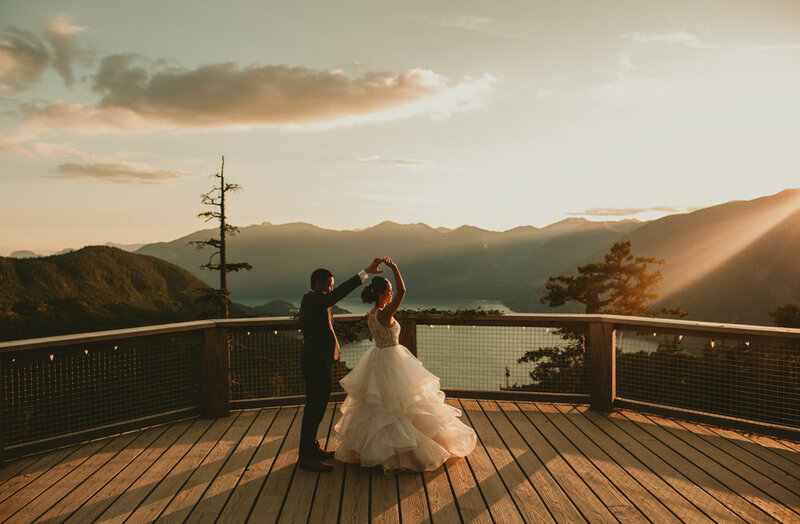 "Jennifer's love for nature and the softness of her photos spoke to us immediately and we knew that she had to photograph our wedding in Whistler! All of the little details she captured that we were to busy to notice and all of the special moments that we will now be able to remember forever. Now we just wish she lived closer so she could photograph our little growing family. Thank you so much for capturing our special day. We can't thank you enough!!" "My husband I and were searching for a wedding photographer for months, when my girlfriend showed me her wedding photos that Jennifer took, I knew right away she would be the perfect photographer for our destination wedding in Mexico. She has a unique style to her photography, which makes the images she captures so surreal and dreamy. We also booked her for our engagement shoot at a beautiful secluded lagoon in Mexico a day before the wedding. She chose the location and it was such a perfect spot. We couldn't be happier with our wedding photos and we've had so many compliments - even strangers have told us they love our photos! We are so glad we chose Jennifer to capture our destination wedding!" "When my husband and I started planning our wedding on the Sunshine Coast one of our top priorities was finding a wedding photographer that could not only capture us as a couple but could also capture the essence of the West Coast. As soon as I saw Jen's work I fell in love and I knew that we had to have her as our wedding photographer. Throughout all of the stages of planning Jen was amazing to work with! She was always easy to get in touch with and she was very flexible in creating a package that fit with what we wanted. For two camera shy people, Jen made us feel comfortable and completely at ease in front of the lens and really made it a fun experience. We absolutely love our photos by Jen. They reveal the beautiful west coast landscape and tell the story of our wedding and love all on their own. We will cherish them for years to come."